The Valldemossa, Soller and Palma VIP tour will take you to visit one of the most beautiful parts of Mallorca. This excursion will take you through the Serra de Tramuntana mountain range that on the 27th june 2011 was designated as a UNESCO World Heritage site and area of great physical and cultural significance. Available for all cruise ships and for private groups from hotels! Depart from the port for VALLDEMOSSA through the stunning Mallorcan countryside admiring the olive trees and the local vegetation, Valldemossa is one of the most beautiful village located 14 kilometres from Palma on the western area of the island and at almost 400 meters above the sea level. It is surrounded by the Tramuntana mountain range. This well maintained village with its old streets, charming buildings, gardens, hanging baskets, and small street bars create a relaxing atmosphere. The most famous attraction is the Cartuja de Valldemossa. You will also have some free time to relax and to try the famous “coca de patata”, a small type of bun that is famous in Valldemossa. After that, we will have a beautiful drive along a fantastic coastal road with great views of the mountains and the sea. we will pass Sa Foradada, Deia and Lluchalcari, this road will take us to Soller where we will stop. 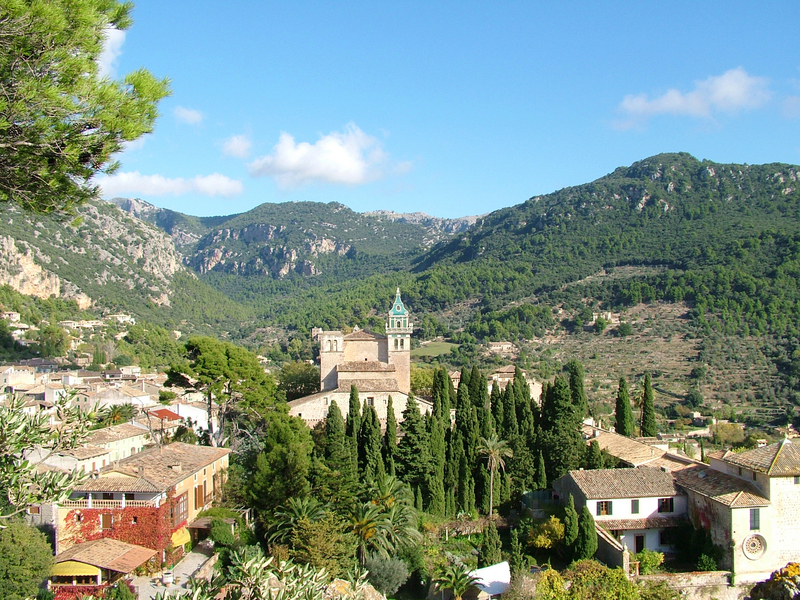 SÓLLER – Situated in a valley and sheltered by the Serra de Alfabia mountain massif. We shall visit its central plaza, small gardens with lemon trees and flowers lining the streets. 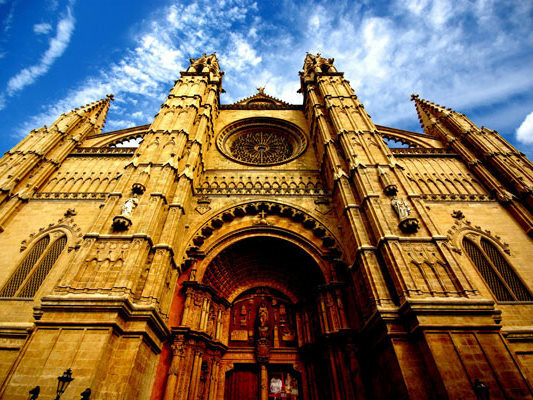 One of the most impressive sights of Sóller is the church designed by a student of the renowned architect Gaudi. Particularly eye-catching is the vas rosette window on the church façade, carved in stone, and the Baroque sculptures contrasting with the dark interior. PALMA DE MALLORCA – We then drive to the city of Palma de Mallorca where we have a guided walk of the town. Please select your cruise ship in the booking box to see the tour departure time scheduled. For private tours or groups from hotels the time departure will be agreed. 00.00 – Depart the port for Valldemossa. 00.30 – Arrive at Valldemossa and a guided tour of the village. 01.30 – Depart for Soller passing through Deià. 02.20 – Arrival at Soller with the fantastic church of Saint Bartolome and the “Banco de Soller” both art nouveau. 03.10 – Depart to Palma. 05.15 – Departure to the port of cruises. 05.30 – Arrive at the port of cruises. If you are arriving on a cruise, you can enjoy one of our most popular tours with personalized VIP service (for a maximum of 22 passengers). We recommend that anyone interested should pre-book the tour, at no charge, combined with the roll call system in the main cruise forum, as this helps you to create groups. This tour will operate with a minimum of 12 passengers! – Offers fantastic photo opportunities, breath taking views, an opportunity to view the scenic beauty of the Mallorca west coast and the beautiful villages of Valldemossa, Soller and the Palma city centre. - Official English speaking guide who will explain lots of interesting things. - Discover a UNESCO World Heritage site, the Serra de Tramuntana. 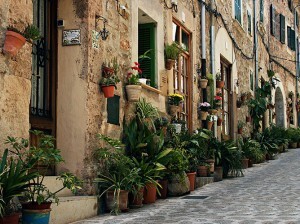 Majorca-tours recommend the VIP tour Valldemossa-Soller-Palma. In order that we may reach the minimum number we strongly recommend that you pre-book (free) to register your interest both on our system and also to potential tour mates. If you are a cruise ship passenger we suggest you to use roll call system in the main cruise forum to help you to join tour mates. When we reach the minimum of 12 pax required, you will be notified by mail to proceed with the booking and payment of your tour. We will send you an invoice immediately after you have made your booking, it will show the details of your reservation (cruise ship, the day and the departure time of your tour). A representative from majorca-tours will be waiting to assist you at the port. The telephone number to contact the assistant (who is always in communication with the tour guides) is +34649020520. We would ask you to be punctual so that other passengers are not kept waiting, we will wait a maximum of 15 minutes after the advertised departure time. The times are programmed with a margin of at least 15 minutes of the ship’s arrival time. You do not need to worry if the ship is delayed as we will be waiting for you and any other passengers who are arriving on the same cruise ship. Our tours are cruise ship friendly. Why us? We are locals and have the best official licensed guides on the island working in all the main languages, and offer a personalized VIP service at a reasonable price. If you would like a personalized excursion, please contact us at info@maiorcaescursioni.com. We will organize everything for you, including full day tours with reservations at the best restaurants. My husband and I will be in Palm de Mallorca on May 30. We are sailing with Celebrity Infinity. I noticed on our ship’s roll call that a number of passengers have booked this tour with you. Is there room for two more people? Your tour sounds really wonderful and would hope to join the others on this tour. Please provide any other information regarding this tour. Looking forward to hearing from you shortly. I have made the pre-reservation for you for Valldemossa, soller and Palma VIP tour. Please note that not possible to visit the Majorica pearl factory in this tour as the Majorica pearl factory is located at about 34 km, from Palma but in the other opposite side of the Island that Valldemossa and Soller. If it helps in Valldemossa there is a shop, which belongs to the same owner of the pearl factory and the prices are factory prices, the same as in pearl factory. I set up a tour for Palma city tour – Tour duration 4 hours. After veviewing the tour I did another reservation for the Valldemossa-Soller and Palma VIP Tour. I put notes to take my name for 2 ea on the first tour. I want to be sure that was done. My mom needs a wheelchair for the walking part, is it accessible in the city? If needed, could she stay on the bus? I reccommend you to make a pre-booking at no charge and when we reach the minimum pax required in this tour (12pax) will inform you. we shall be in Palma on 15th April 2018 on board the Symphony of the Seas and would like to take your tour. Will it be available on the 15th as your first date is 22nd April. We are a party of 2. Appreciate your help. Thanks. Loved this tour! The guide was great, the vehicle had plenty room, and the towns were wonderful! Looking forward to coming back again and booking another tour with you. It is 5h30 minutes duration tour, yes we have room at the moment, I suggest you to book a.s.a.p. as the space limited. Do You have room on your group tour that I’m seeing on the cruise critic roll call for this ship? We are interested in the Valldemossa-Soller-Palma VIP tour , will be arriving at 8am on 25th Oct via Thomson Spirit ( I couldn’t find this cruise line on your pre-book section), do you have enough room for 3 of us or will you have enough people to go ahead? Looking forward to hearing from you. Many thanks. Unfortunately you are the first 2 in pre-book for this date and tour. If you are a cruise ship passenger we suggest you the roll call system in the main Cruise Forum to help you to find tour mates. Updated: 03/09/2016 – Now we have reached the minimum and you can book. Updated: 05/09/2016 – I see that you have made your reservation. Thank you for post in cruise critic. You can make your pre-booking here by selecting your cruise. But please have in mind that we need a minimum of 12 pax to operate this tour. We x 2 persons will be onboard Oceania Sirena on the 3rd July. 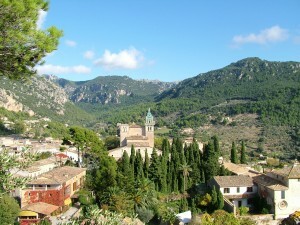 Is there availability for the 3rd July Valldemossa – Soller and palma VIP tour please ? Do you have enough people for this tour on June 13, 2016? Please note that this tour is not recommended for your companion because there are some walking involved: 1h20m walking (20 min Valldemossa + 30 min Soller + 30 min Palma). I suggest him our Valldemossa tour or the Vip Palma and Valldemossa. We are interested in the Valldemossa-Soller-Palma VIP tour but my companion will be travelling with a collapseable wheelchair. He is able to get on and off a bus, but can only walk short distances. How accessible is this tour when using a wheelchair? Yes we have 6 seats available, If you are interested I suggest you to make the reservation a.s.a.p. to ensure the seats. Would you be able to accomodate four of us on Sunday, Oct 4th for the Palma, Valldemossa, and Soller tour? We arrive at 8am on Celebrity Equinox and leave around 4:30pm. Thanks in advance for considering our request! We regret to inform you that we just have your five reservations so far, as you know we need a minimum of 10 pax to operate this tour, only in case we manage to get the minimum of participants will let you know and you will decide if are you still interested. If we do not reach the minimum we do not send any communication. We suggest you to post in the roll call of your cruise in cruisecritic.com to try to get tour mates. Should you need any more information do not hesitate to contact us. I was calling to inquire about the Valldemossa-Soler-Palma tour that I pre-booked a few weeks ago. The request was for 5 people on 11/3 and I have not heard anything from you.